Surgical Staplers Market size was valued over USD 3.7 billion in 2017 and is expected to witness more than 7.2% CAGR from 2018 to 2024. Rise in number of surgical procedures in the developed regions of North America will enhance the growth of surgical Staplers market. According to the recent data from National Center for Health Statistics, around 50 million surgical procedures are conducted in U.S. annually, that majorly include appendectomy, cardiovascular and general surgeries. The increasing effective use of surgical Staplers in several different surgeries has resulted in increased number of surgical procedures that are conducted without much post-surgical complications. Technological advancements in surgical Staplers has resulted in manufacturing of different surgical devices and other instruments that are effectively and safely used in surgical procedures. The progression of mechanical sutures by use of surgical Staplers has led to market growth by minimizing the earlier surgical complications. Currently, surgical Staplers are repeatedly used several times in chronic surgical procedures such as complex laparoscopic operations, digestive reconstructions and extensive resections. The rising cases of adverse events and product problems resulting in numerous patient’s deaths and injuries will be one of the industry impeding factor. Adverse events were reported by the U.S. Food and Drug Administration (FDA) Manufacturer and User Facility Device Experience (MAUDE), that involved use of surgical Staplers in surgical procedures. Circular surgical Staplers dominated the surgical Staplers market in the year 2017 with a total revenue of USD 1,447.6 million. The varied range of applications provided by the circular Staplers in chronic and complicated surgeries will enhance the business growth. Increasing use of circular Staplers for end-to-end anastomosis such as cervical esophagogastric anastomosis in esophagectomy will increase the product business expansion. Linear surgical Staplers market is anticipated to grow at a considerable rate the industry with CAGR of 7.1%. Increasing use of linear Staplers in paediatric surgery, abdominal surgery, thoracic surgery and gynaecology will result in high product adoption rate during the forecast period. The ease of use and accessibility to narrow anatomic sites provided by the linear surgical Staplers will lead to significant increase in the segment revenue in the upcoming years. 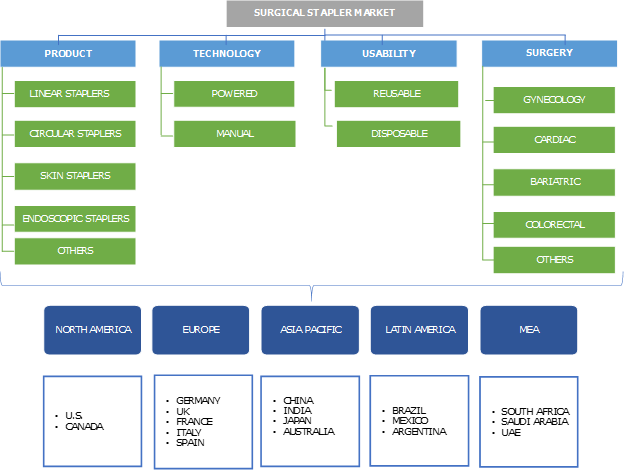 Powered surgical Staplers held major market share in the year 2017 and accounted for total revenue of USD 2,749.2 million. In recent past increased research and development activities to enhance the operational capabilities of surgical Staplers has resulted in powered surgical Staplers gaining large number of market share in the surgical Staplers industry. Manual surgical Staplers business is estimated to grow at substantial rate during the projection period at a CAGR of 6.6%. Manual surgical Staplers are economical as they are available at affordable price and are very easy to use giving added advantage to the healthcare professional practicing in the developing regions. The increasing use of manual surgical Staplers for surgical procedures in the developing regions will lead to the business size expansion. 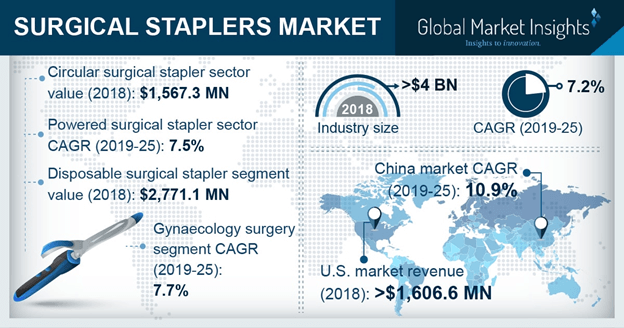 Disposable surgical Staplers business segment accounted for USD 2,566.3 million in 2017. Disposable surgical Staplers is ideal for post-operative wound closure and for caring of minor wounds. The use of disposable surgical Staplers in the complex chronic surgeries such as cardiac surgeries will augment the growth of product segment in the near future. Reusable surgical Staplers business is forecast to grow at CAGR of 7.0%. The adoption rate of reusable surgical Staplers is quite high in the developing regions as they are economical to use and are preferred by the healthcare professionals. Also, considerably less impact on environment will result in robust growth of reusable surgical Staplers in the forthcoming years. Bariatric surgery business valued USD 1,139.4 million in the year 2017. According to World Health Organisation (WHO), about 13% of the total world population was obese in 2014. Also, according to American Society for Metabolic and Bariatric surgery, total number of bariatric surgical procedures conducted in U.S. in 2011 were around 300,000. Rise in number of bariatric surgery will increase the use of surgical Staplers resulting in segment growth. Gynaecology surgery segment is anticipated to grow at considerable rate in the upcoming years at CAGR of 7.7%. In U.S. around 4 million babies are born every year, out of that 33% babies are born through caesarean delivery method. Increase in number of child births across the world through caesarean surgery will enhance the industry growth. U.S. dominated North American surgical Staplers market with the revenue of 1,439.4 million in 2017. Ongoing technological advancements leading to manufacturing of superior quality surgical Staplers coupled with increase in number of surgical procedures conducted in U.S. will result in higher revenue share over the forecast period. Also, availability of sophisticated infrastructure required for carrying out complex surgical procedures will drive the regional growth. Chinese surgical Staplers market is forecasted to show robust growth rate of 10.6%. Increasing geriatric population suffering from chronic disease such as cancer, cardiovascular disease and diabetes will lead to more number of surgical procedures conducted in the country. Moreover, technological advancements and improved operational capabilities of the manufacturing companies will expand the industry size in forthcoming years. Some of the leading players in the surgical Staplers market include 3M, B. Braun Melsungen AG, Conmed Corporation, Ethicon Inc., Frankenman International, Grena, Integra Life Sciences, Intuitive Surgical, Medtronic PLC, Meril Life Sciences, Purple Surgical, Reach Surgical, Smith & Nephew PLC and Welfare Medical. These companies focus on geographic expansion in order to penetrate the untapped developing regions of Asia Pacific and Latin America. Also, merger and acquisitions has resulted in companies expanding their product portfolio and sustain in the market by providing better and technologically enhanced products to the customers. Increasing in number of surgical procedures across the world and rising global demand for surgical Staplers over traditional wound closure methods such as sutures will propel the industry growth in the near future. Many companies are focusing on development of Staplers that provide better efficacy that will improve the overall healthcare sector globally. Provision of technologically advanced surgical Staplers with maximum effectiveness and safety will increase the product demand and product adoption rate in the upcoming years.